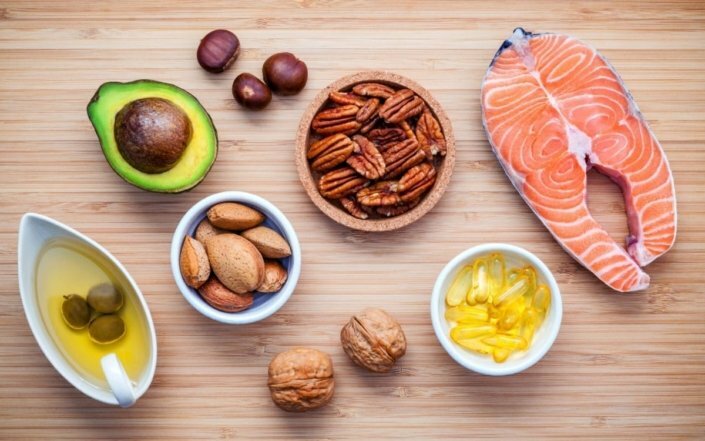 Certain fats should be part of your diet. But you should make sure you’re eating good fats instead of bad fats. Your body uses fat for energy. It builds nerve tissue and hormones and controls inflammation. Good fats help your body absorb vitamins A, D, E, and K from the foods you eat. They provide health benefits and can lower your risk of disease. Consuming too much fat can lead to obesity. Fat calories turn into body fat more easily than carbohydrates or proteins. They also can confuse your appetite, so you can’t tell when you are full. Bad fats raise your total cholesterol and blood pressure. They can increase your risk of heart disease, diabetes, and some cancers. Everyone has different calorie needs. Your doctor can help you figure out how many daily calories you need. This will help tell you how many grams of fat you can consume. If you are overweight, the American Heart Association (AHA) recommends that you get less than 30% of your total daily calories from fat. This equates to 65 grams of fat for a 2,000-calorie diet. You should limit saturated fats and avoid trans fats. They often are found in fast food, fried foods, and snack foods. They also can be in desserts and commercial baked goods. These bad fats increase your LDL (bad) cholesterol levels. They decrease your HDL (good) cholesterol levels. Omega-3 fatty acids are usually found in seafood. This includes salmon, herring, sardines, and mackerel. Flaxseeds, flaxseed oil, and walnuts also contain omega-3s. You don’t have to cut all fat out of your diet. However, you should limit the amount of fat you eat. There are 9 calories in each gram of fat. This is more than twice the calories in carbohydrates and proteins. They each have 4 calories per gram. Try to eat foods that contain unsaturated fats and omega-3 fatty acids. Avoid foods that are high in saturated and trans fats. Avoid fast food. It almost always contains trans fat. Limit the amount of red meat you eat. Instead, eat fish, poultry, and vegetable proteins. Use canola oil when you are baking. Use olive oil when you are cooking. You also can use it in place of salad dressing and as a spread on bread. Make healthier snack choices. For example, eat a small handful of unsalted peanuts or edamame (soybeans) instead of potato chips. Try a serving of avocado on your sandwich or in your salad. Nuts and garbanzo beans also are good on salads. Use liquid or soft tub margarine instead of butter. Look for margarine that has low saturated fat and no trans fat. What percentage of fats should I eat if I’m trying to lose weight? Should I take an omega-3 supplement to get more good fats?